PG Systemtechnik GmbH & Co. KG, Germany was founded by Wilfried Naumann and Klaus Sasserath. 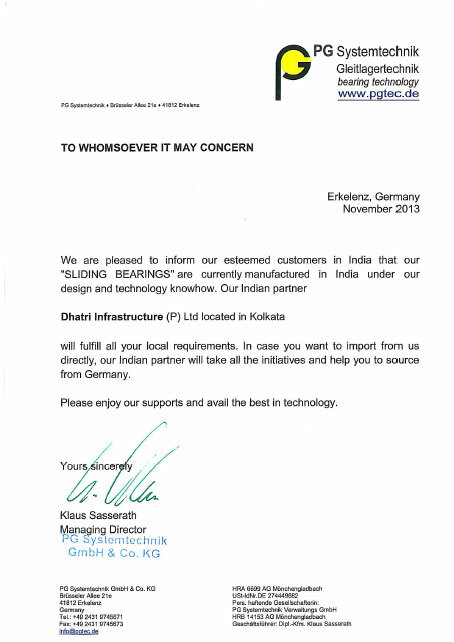 Both have many years know - how in manufacturing, design and sales of PTFE bearings. PG Systemtechnik is based with its production facilities and administration in the town Erkelenz which is located in the very west of Germany. Under the brand name PGslide® the whole range of PTFE sliding bearings for power plants, pipe constructions and all types of civil engineering is produced. Bearing types are flat sliding supports, spherical bearings, pointed rocker bearings and custom tailored bearings. PGslide® sliding bearings with PTFE (brand name e.g.Teflon®) as sliding material are used in applications which carry heavy even extreme loads, but at the same time have to move freely in two or three dimensions. Main fields of application are hot /cold or cryogenic pipe systems, huge steelwork structures etc. as found in power plants, bridges or other petrochemical plant constructions. PG Systemtechnik also supplies a variety of PTFE products such as semi-finished and finished parts–from easy shapes to high sophisticated designs, which can be integratedinto your own products. A unique offer is PTFE sheets, rods and pads in special bearing and bridge bearing quality-supervised by independent testing authorities. In addition PG Systemtechnik can offer design and calculation of sliding bearings and accessories as well as calculation of the connection to / or for on site structure. On customers request additional services such as: assembly and installation instructions, training on site, installation by professional fitting and installation companies can be made.